This book deals with the subject of political development through several axes, shall be put in the first chapter of the book is based on an analytical model considering the study of development and underdevelopment confluence of Social Sciences, as well as to look at schools as a political development research programs for the study of the political economy of development. The second chapter, it raises critically recent literature in the field of political development shown by the political heritage of your third world. The third chapter is devoted to a discussion of what he called the writer radical theory of development as a research program, the author focuses in this chapter on Alciologih aspects of sociology of underdevelopment. Tries in the fourth quarter Hajot Find common ground between the general political trend in the development and the state in the Third World. In order to achieve the desired goal from behind the translation of this book has been added to chapter V of the theory of development in the post-modern books d. Nasr Aref, a researcher on Bachkalaat renaissance in our societies on the basis of what is owned by the elements of the pillars of the mildly-style Islamic cultural knowledge. It raises the vision of (other) target both at the stage of the project modernist or postmodern. 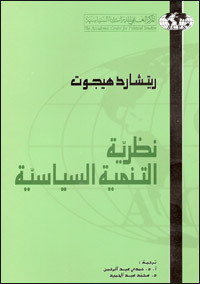 The circular for the benefit and convenience of the reader and university students in particular, was added to the bibliography book illustration of the most important Arab terminology and concepts contained in the English text, and this book is a distinct addition to the field of theoretical studies to the subject of political development.